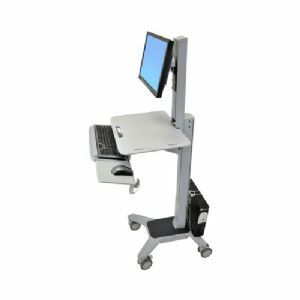 The Ergotron WorkFit-C Sit-Stand Workstation is a sit-stand computer cart for single monitor having 40lbs maximum load capacity which also has a Patented Constant Force lift-and-pivot motion technology. It is equipped with lockable casters for a stress-free mobility and provides a 25-degree tilt, 360-degree rotation, and can be height adjusted up to 25" lift range. Buy the Ergotron WorkFit-C Sit-Stand Workstation today!